A five-week expedition to map and sample a giant underwater canyon off the northwest coast of Morocco has completed its mission, yielding the best look yet at the deep-sea wonder. More than half a mile (about 1 kilometer) deep, 280 miles (450 km) long and up to 20 miles (30 km) wide, Agadir Canyon is approximately the size of the Grand Canyon. A joint team of British and German scientists aboard the German research vessel Maria S Merian took images and samples of the seafloor to create a high-resolution 3-D map of the canyon and sample its marine life. Up until now, Agadir Canyon, considered by some measures the world's largest undersea canyon, has rarely been explored, said British expedition leader Russell Wynn of the National Oceanography Centre in England. "There are a lot of interesting features that no one has ever gone and looked at," Wynn told LiveScience's OurAmazingPlanet. Long flows of sediment carved out the canyon over millions of years, much like a river carves out a canyon, including the Grand Canyon, on land. 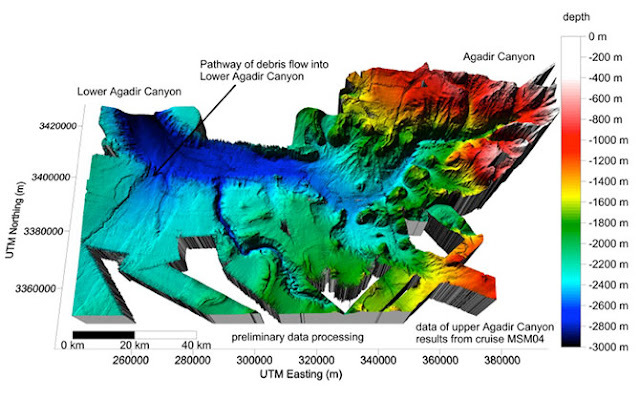 Researchers had mapped Agadir Canyon previously at a very crude scale that revealed features a few hundred meters big. Now, using a technology called multibeam sonar, Wynn and his colleagues have mapped the region on the scale of a few meters to tens of meters. The team discovered that Agadir Canyon produced the world's largest sediment flow about 60,000 years ago, depositing up to 38 cubic miles (160 cubic km) of sludge during a single catastrophic landslide. 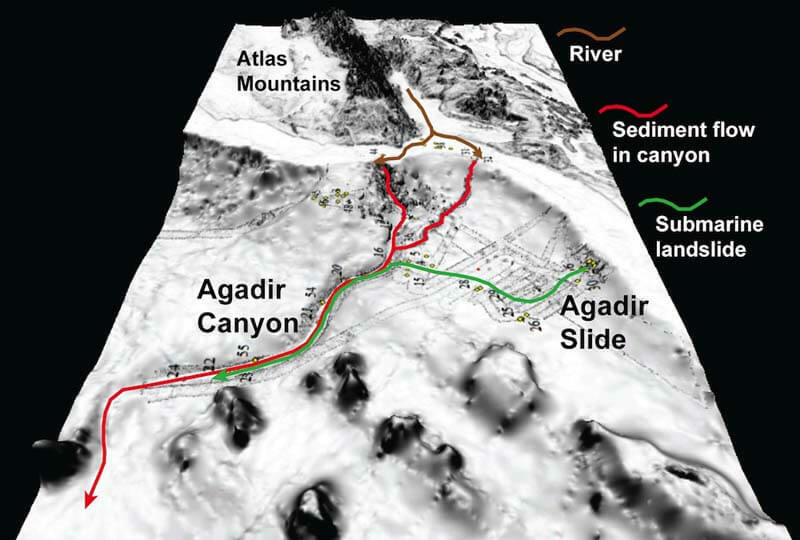 Powerful flows from the Atlas Mountains of Northwest Africa carried sand and gravel to deep offshore basins nearly 3,000 miles (5,000 km) beneath the sea surface, depositing the sediment over 135,000 square miles (350,000 square km) -- an area roughly the size of Germany. The team also found a gigantic new landslide south of the canyon that covers more than 2,000 square miles (5,000 square km) of seafloor, about the size of the state of Delaware. This flow didn't mix with the other flows, but blocked up the end of the canyon, "like toothpaste," Wynn said. Preliminary data suggest the flow is quite ancient, at least 130,000 years old, he added.